Με φιλοξενία σε έναν από τους μεγαλύτερους δικτυακούς τόπους πληροφόρησης για την Επιστήμη, ο Δήμος Τρικκαίων συμβαδίζει με τη νέα εποχή. Το δημοσίευμα έγινε στις 6 Δεκεμβρίου 2018 και έχει τίτλο Electrifying transportation in Trikala, Greece (Εξηλεκτρισμένες μεταφορές στα Τρίκαλα). Το κείμενο στα αγγλικά αναφέρεται στα όσα συμβαίνουν στην 1η ψηφιακή πόλη της Ελλάδας σχετικά με το πρόγραμμα ELVITEN που ήδη εγκαινιάστηκε τον περασμένο Σεπτέμβριο και σύντομα θα υλοποιηθεί. Μάλιστα, οι επισκέπτες του Μύλου των Ξωτικών μπορούν να δουν κάποια από τα οχήματα που θα χρησιμοποιηθούν στο πρόγραμμα, έξω ακριβώς από την κεντρική είσοδο. Across Europe, cities are trying to find ways to reduce traffic congestion and provide clean and reliable energy solutions for their citizens’ transportation needs. Phasing out internal combustion engine vehicles in favour of electrified transport is a significant step towards cleaner mobility. This is a step that Europe is taking seriously judging from the more than 40 % increase in electric vehicle sales in a single year. But what about easing the traffic congestions that plague cities? Thanks to their small size and light weight, electric L-category vehicles (EL-Vs) could go a long way towards solving this problem. The challenge, however, is to convince citizens that EL-Vs are capable of meeting their needs. The EU-funded project ELVITEN aims to show citizens the benefits of EL-Vs in urban transportation and to encourage their use in private transport and light urban deliveries. The focus is on electric bicycles, tricycles, scooters and quads. As part of this project, 10 EL-Vs – 5 tricycles and 5 quadricycles – are soon to be deployed in Trikala, Greece’s first smart city. Trikala is one of six cities participating in the project. The other five are Berlin, Málaga and the Italian cities of Bari, Genoa and Rome. A major advantage of EL-Vs is their zero CO2 emissions that contribute towards a cleaner environment. But besides the environmental benefits of EL-Vs, users can also look forward to spending less time travelling from place to place in small cities and less time looking for a parking space in larger urban areas. 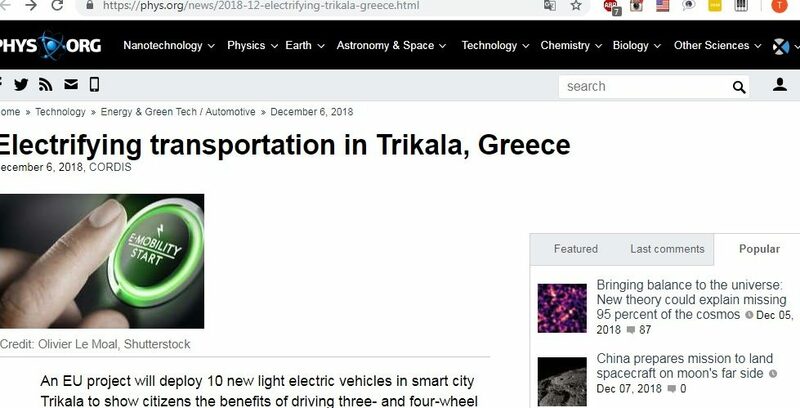 In a news item posted on the ELVITEN project website, Mayor of Trikala Dimitris Papastergiou said that EL-Vs “can help people to make their daily commutes smoother and more ecological and faster in cases of transport, delivery and public service needs.” The three-wheel vehicles will be made available to courier companies and delivery services, while four-wheel EL-Vs will be stationed in Trikala’s public car parks for citizens interested in trying them out around the city. 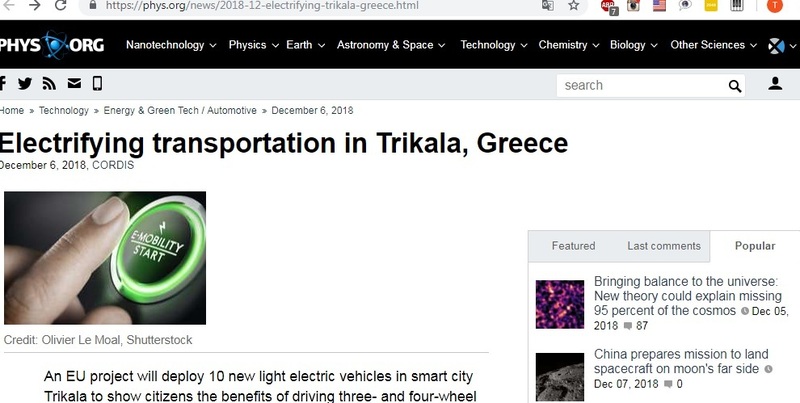 “These vehicles will show that technology has begun to mature and to provide solutions to the everyday life of a city,” Papastergiou explained. Starting in the last quarter of 2018, the vehicles will circulate free of charge in the smart city for a year. Particular vehicles and routes will be selected via a dedicated platform that records routes and timetables. Special tracking equipment installed in the EL-Vs will record speed, potential delays and EL-V movement around the city. Through this effort and similar endeavours in the other participating countries, ELVITEN (Electrified L-category Vehicles Integrated into Transport and Electricity Networks) seeks to collect real usage data on EL-Vs. The project partners will use this data to generate guidelines and business models for service providers and vehicle manufacturers.